I have been familiar with meditation and the benefits of practice for about 14 years now and only in the last 5 years have I’ve seriously attempted to establish a regular meditation practice, with “daily practice” being the goal. During these first years I’ve used the excuse of not enough time and allowed myself to meditate when I felt like doing it – well I did exactly that and I really didn’t feel like meditating very often. I would practice 10 min here and 5 min there, some month I didn’t feel like sitting at all, so that didn’t work at all. Another attempt was to join Free guided meditations online that run for 15 or 21 days with hopes that they will motivate me to do a daily practice. It did work for a few days and then I used the same excuse of not enough time or I found something wrong with the guided sessions and fell behind. It worked, but only for a short time. Over the years meditation became for me very similar to keeping active and physically fit. I knew of hundreds of reasons of why I should do it, but just didn’t take the time to do it regularly. I would have spurts of activity and then nothing for a while, followed by another spurt and so on… But reflecting on that I know that the only time I was successful is if I established a routine and made it really important for myself to keep that routine 100%. No excuses, Just Do It! It was only after my family moved to Bucks County, and I started going to Monday evening meditation at the sangha(a community of practitioners), that my meditation would become more regular. I could always count on Monday night for 45 minutes of meditation and a wonderful discussion afterwards. One of the great aspects of a sangha is that you meet others with similar motivations as yourself and can ask for help as needed. So after some time I decided to ask for help and one member graciously agreed to support me with my goal of a regular practice. We became meditation buddies and kept each other accountable for getting on the cushion and sharing about what came up in our practice. We did that for a month or so and I was able to meditate on a regular basis with his support. As of today I established a routine to meditate for as little as 5 min in the morning no matter what. I use an app on my phone which keeps time and measures how many days in a row I meditate as well as how many days total. I try hard to keep my streak going every day. There are also meditation friends in this app that I see are meditating and I can see their streaks. It definitely motivates me to keep going to get to my next milestone. So I would say finding this app definitely helped me keep my commitment to a regular daily practice. I use the app during walking, sitting, and guided meditation of any kind, including Monday nights at the sangha. I don’t count the times I am purposefully mindful during the day and take a minute to myself to just breath. I don’t count Yoga practice, although it’s also a great moving meditation practice. Set an intention and make a 100% commitment to meditate every day or x number of days/week for at least 5 minutes. This is very important because why would you do anything without first making a commitment to it? Establish a place you can meditate that is free from disturbance. 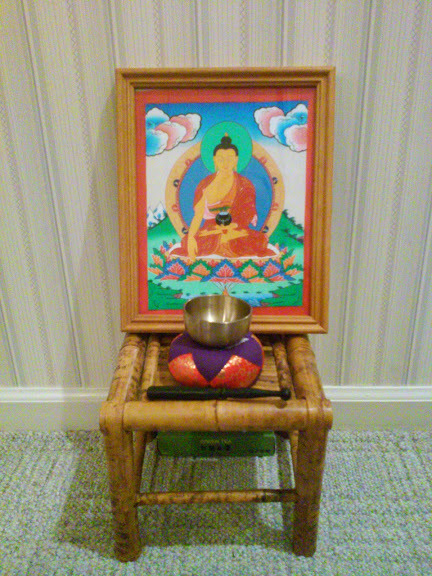 I have a nook in my office with a cushion, a bell and a picture of meditating buddha for inspiration. I am sure you can find such a spot in your home. Join a sangha community near you and participate in group meditation and discussions. This is key – they don’t call it the 3rd jewel of Buddhism for nothing! The sangha is my source of all 3 jewels. 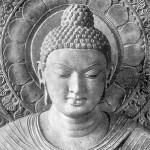 Meditation, Dharma talks and discussion, and community support. There are many virtual communities online you can join if you can’t find a group near you. Don’t be hard on yourself and know that when you are ready, you will find a way to establish a regular practice and it will be nothing like you expect but it will transform your life. You will be ready when you commit 100% to meditating no matter what. This entry was posted in Home and tagged meditation. Bookmark the permalink.